Advocates for Women’s Rights, like Elizabeth Cady Stanton and Susan B. Anthony, Anti-Slavery Activists like Frederick Douglas and Harriet Tubman, spurred on movements that gained national attention. Even now, there’s an energy here that more and more visitors are tapping into by visiting the Women’s Rights National Historic Park, Stanton’s Seneca Falls Home, the Women’s Hall of Fame, and even It’s A Wonderful Life Museum – based on the uplifting, one-person-can-make-a-difference Frank Capra Movie. 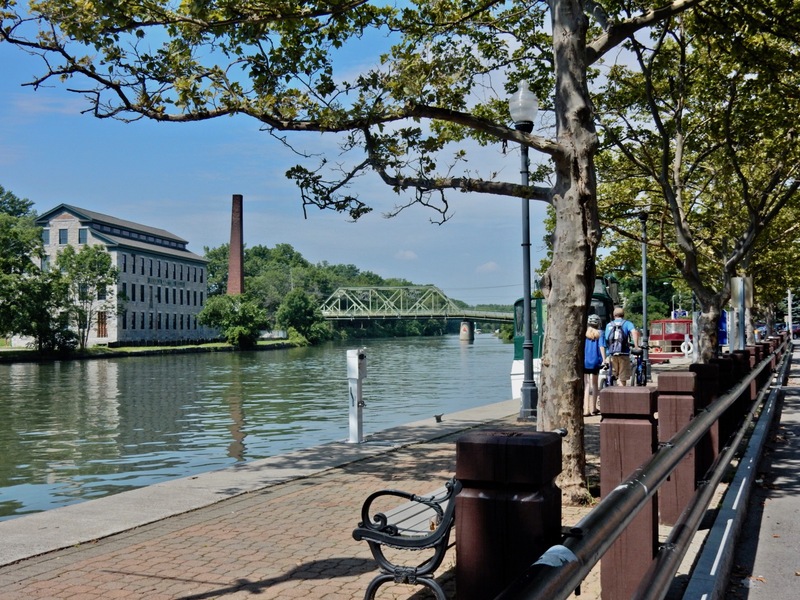 End the day by staying in the small Erie Canal town of Newark, in the former home base of the company that brought the “mail order rose” to mass market USA on this Women Power NY Getaway. 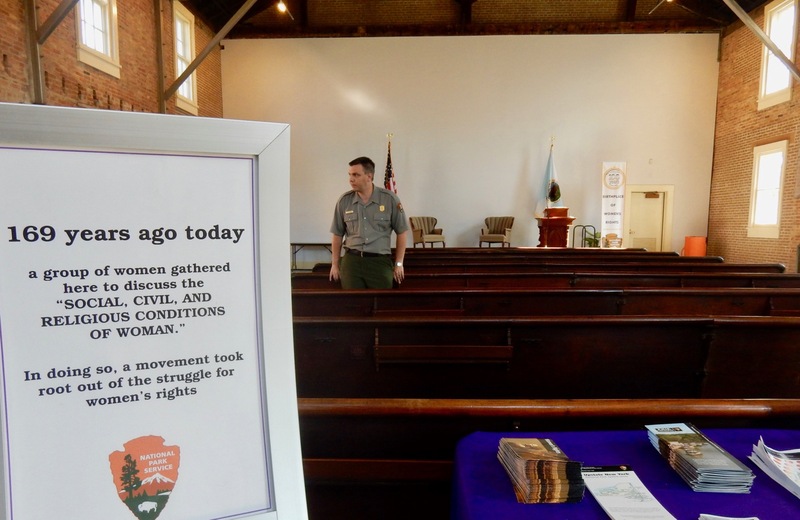 TOUR: Women’s Rights National Historic Park, Seneca Falls. 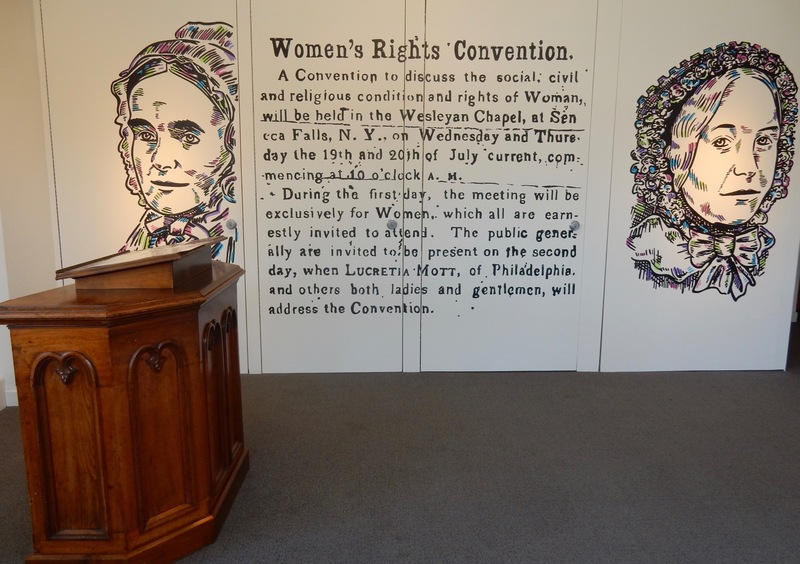 Seneca Falls NY was the site of the first Women’s Rights Convention in 1848. Though Harriet Tubman and Frederick Douglas moved to this land of Temperance and Abolition after escaping slavery in Maryland, the story of Seneca Falls focuses most on suffragist, Elizabeth Cady Stanton. Stanton had attended a 2-day Women’s Rights Convention in London where only men spoke – women could attend but not be heard. Stanton, who lived in Boston with her attorney husband, swore she’d rectify that with a true Women’s Rights conference. Stanton’s father sent her, with her husband, to Seneca Falls – a Quaker stronghold – so that she wouldn’t cause trouble in Boston. But without the distractions of the city, Stanton’s fervor for Equality blossomed here. At the time, women didn’t have rights to their own children, title to property, or ability to vote. Stanton wrote the Declaration of Sentiments – an “alt” Declaration of Independence – which she presented at a hastily planned Women’s Rights Convention. The 2-story Park building features a wealth of exhibits about the Women’s Rights movement – then and now all over the world. 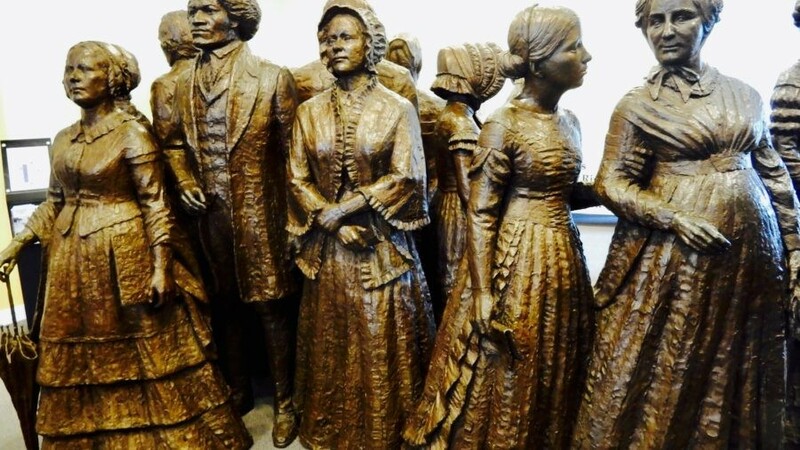 You can mingle among 20 statues of women and men Suffragists: Elizabeth Cady Stanton, Lucretia Mott (Abolitionist from Philly), Harriet Tubman, Frederick Douglas, Richard Hunt (financial backer who helped pay for the Wesleyan Chapel), Martha Wright (known to neighbors as “a most dangerous woman”), and others. 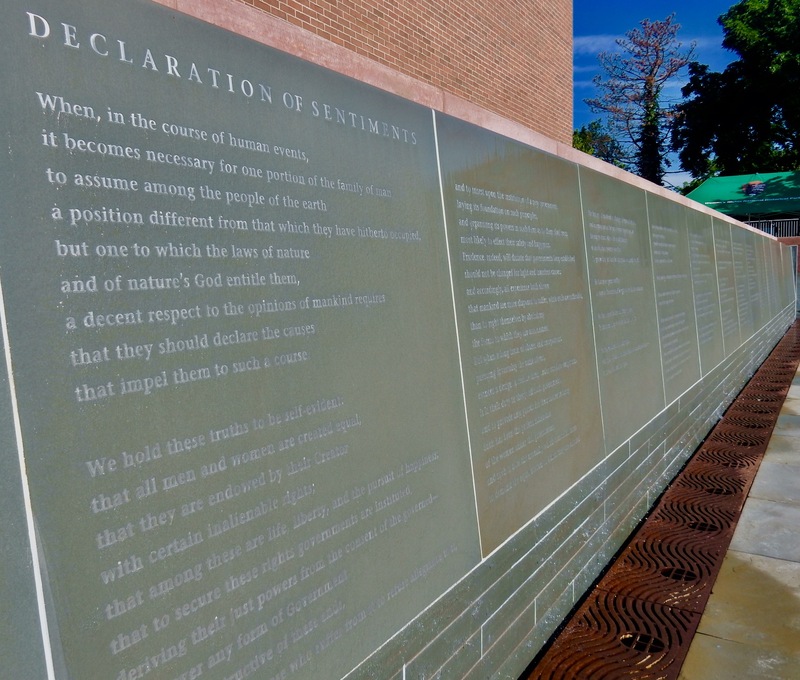 The tour continues outside, first to the “Water Wall” etched with the complete Declaration of Sentiments and names of the 68 women and 32 men who signed it, and then next door into the restored Wesleyan Chapel, site of the Convention itself. Over the years, the Chapel had been used as a laundry mat, and even a car mechanic shop. 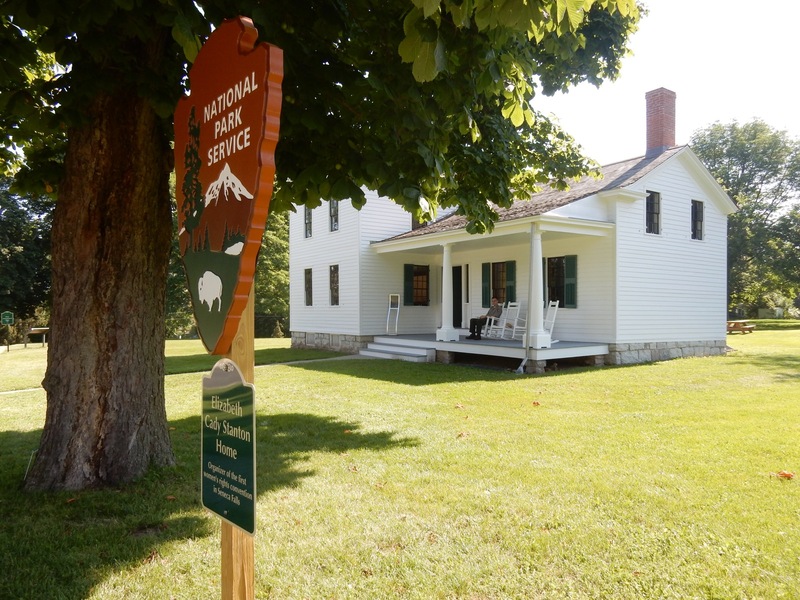 In 1980, the National Park Service purchased the property, and in 1993 opened it as a restored historic site. Though 300 people attended the Women’s Right’s Conference, only 100 signed The Declaration of Sentiments, as it was dangerous to do so. The First Women’s Rights Convention got the ball rolling on a very public issue, but it needed a firebrand to turn it into a movement. That’s where Susan B. Anthony, who did not attend this first conference, came into play. Open daily in summer 9-5. PHOTO OP: When Anthony Met Stanton sculpture, Seneca Falls. 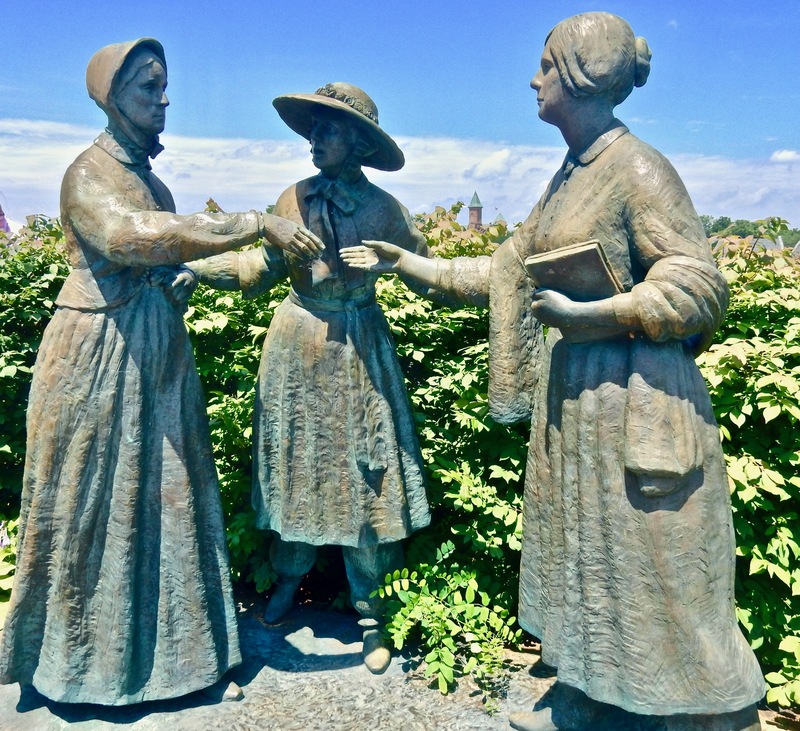 In May, 1851, Susan B. Anthony was in Seneca Falls for a Temperance meeting when a mutual friend, Amelia Bloomer (inventor of the liberating pantaloons that bear her name), introduced her to Elizabeth Cady Stanton on a street corner – a chance meeting that changed the course of history. It’s been said, “Elizabeth forged the thunderbolts, and Susan hurled them.” Until then, Susan B. Anthony’s focus was temperance and anti-slavery. Stanton turned it towards women’s rights. VISIT: Elizabeth Cady Stanton House, Seneca Falls. Elizabeth Stanton raised 7 high-spirited children in this modest house, now about half the size it was originally, in 1847, when she moved in. In those days, it was scandalous to refer to pregnancy or birth. But that didn’t stop Stanton from flying a pink or blue flag outside her home each time she had a baby, shocking the neighbors. The home is filled with windows – as Stanton loved the light and felt fresh air was healthier than being closed in. Because Stanton’s mother was “super strict,” Elizabeth raised her own children with few rules. They learned “bad language” in local taverns, which they’d spout as they served food to guests. (Some visitors, like Lucrecia Mott, however, also swore like a sailor). Stanton’s husband called his children “miserable underdeveloped vandals,” (one would imagine and hope, with some bemusement). Susan B. Anthony visited often to watch the kids so Stanton could write, mostly while Stanton’s husband was away doing Abolitionist work. Elizabeth Cady Stanton was born in 1815, died in 1902 at age 87, and left diaries and letters – including one to Teddy Roosevelt (and his wife) informing the then President that he could be the “next Lincoln” if he emancipated women. That letter was never sent. 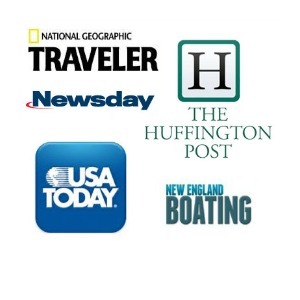 Fri-Sun 10-4, but check NPS website first. 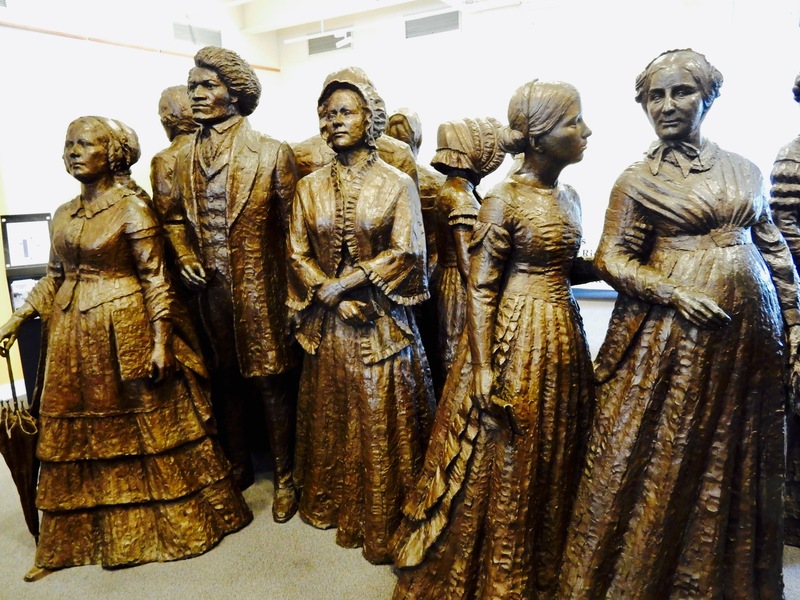 VISIT: National Women’s Hall of Fame – soon to be Center For Great Women, Seneca Falls. 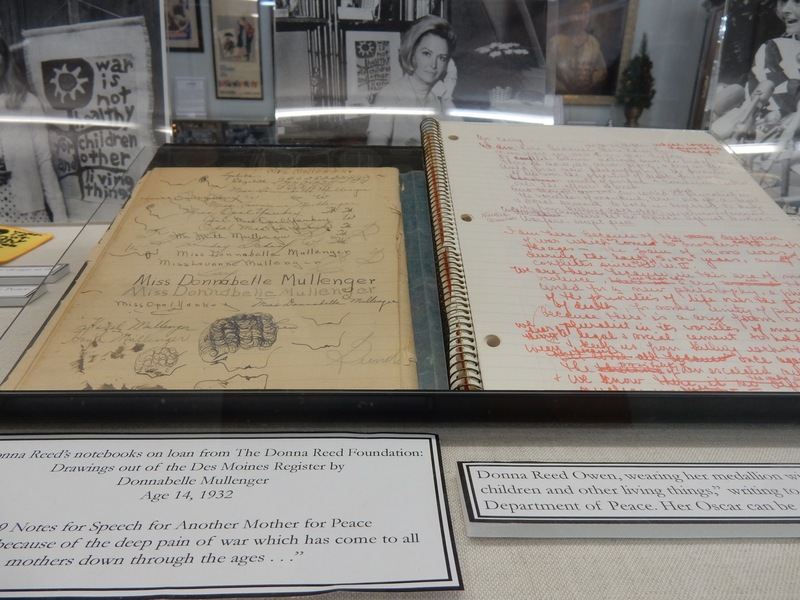 This museum’s mission – “Showcasing great women, inspiring all” was long in coming. Textbooks do not address progress in Women’s History studies: just 10% of historical figures represented are female, even now. Twenty women were first inducted in 1973, with 10 more inducted every other year, nominated by the public and adjudicated by experts in each field. Over 266 women – in politics, science, business, sports, arts, and entertainment – are showcased here on HOF plaques, including Abigail Adams, Maya Angelou, Susan B. Anthony, Hillary Clinton, Emily Dickinson, Ella Fitzgerald, Amelia Earhart, Ruth Bader Ginsberg, Helen Keller, Annie Oakley, Georgia O’Keefe, Rosa Parks, Harriet Tubman, and Oprah Winfrey. 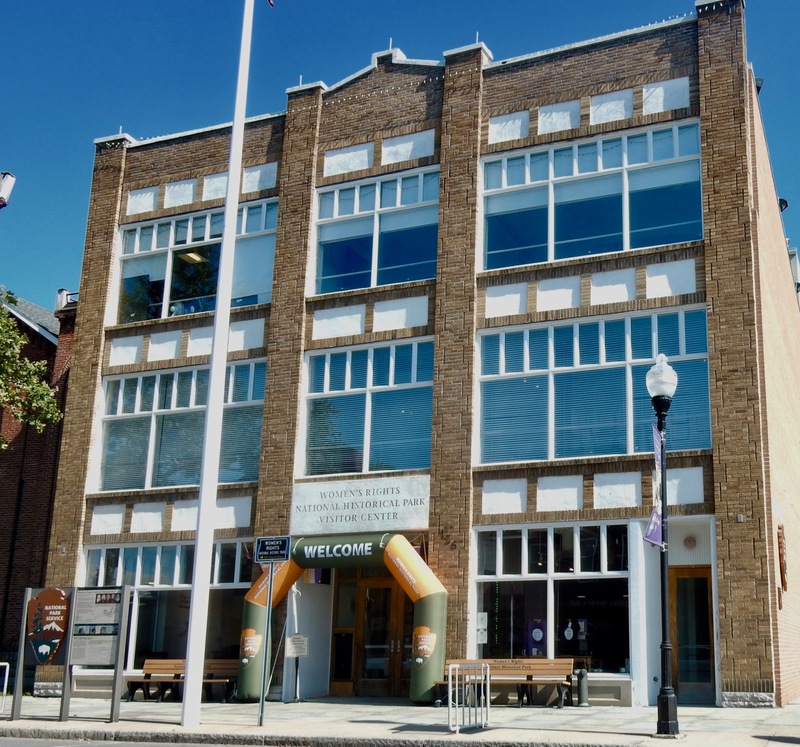 The Women’s Hall of Fame outgrew its store-front space, so in 2018, the whole exhibit plus some moved into a new/old space across the canal – the 1844 Seneca Knitting Mill – and rebranded as The Center for Great Women. Open Wed-Sat 10-4, Sun-Tues 12-4, closed Sun and Mon. Jan-March, $4. 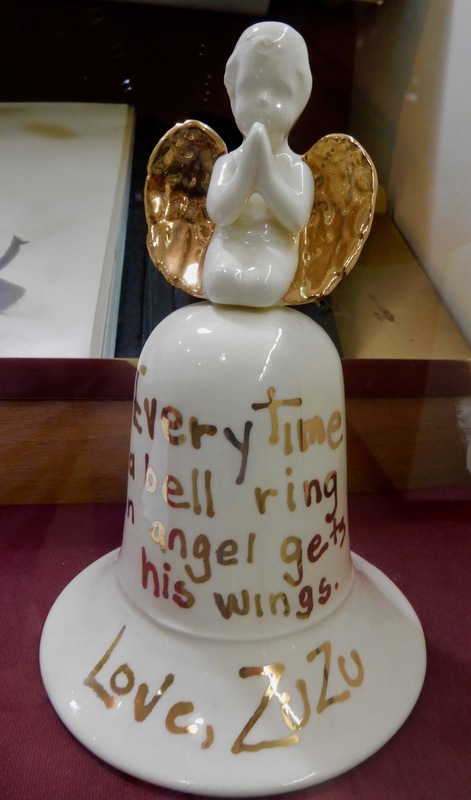 VISIT: It’s A Wonderful Life Museum, Seneca Falls. 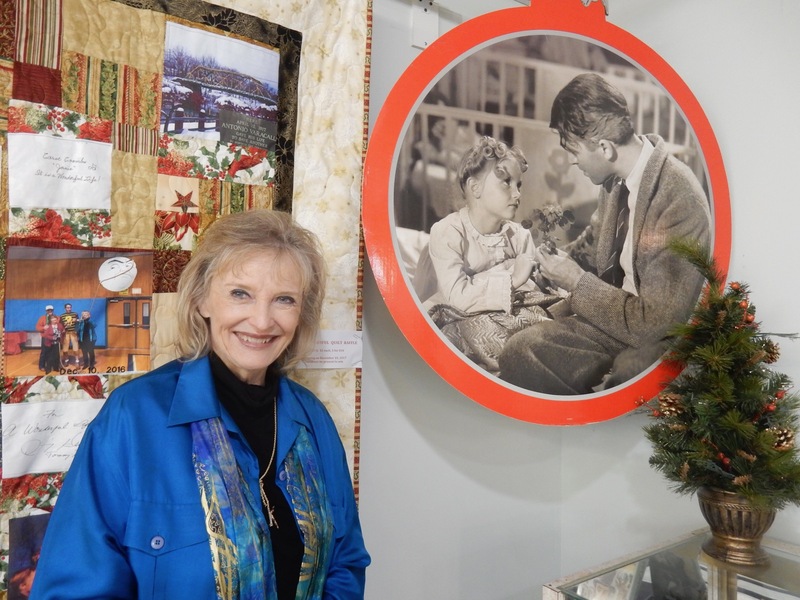 The It’s A Wonderful Life Museum opened in 2010 inside Seneca Falls first movie house, built in 1913. One of only a handful of museums in the country devoted to a single movie, it’s a bit strange that this particular one is in Seneca Falls NY, as this beloved film was made entirely in California. But, here’s the thinking: Director Frank Capra did visit this small town. At the time, he would have read the plaque on what’s come to be known as “Bailey’s Bridge” honoring Antonio Varacalli, who “gave his life to save another” on April 12, 1917. Varacalii, Italian like Capra, jumped from the bridge into the water to save a drowning man and died in the process. It’s assumed that the Director used this event as basis for his movie. It’s A Wonderful Life was not originally slated for a Christmas release in 1947: but because Sinbad the Sailor was not ready, it was pushed up ahead of schedule, proving to be its downfall in popularity at the time. Though it was marketed as a romcom, the story of a man contemplating suicide was quite the holiday bummer, especially just after Americans were returning from war. Consequently, It’s A Wonderful Life tanked at the box office, only finding a new and growing audience decades later on television. 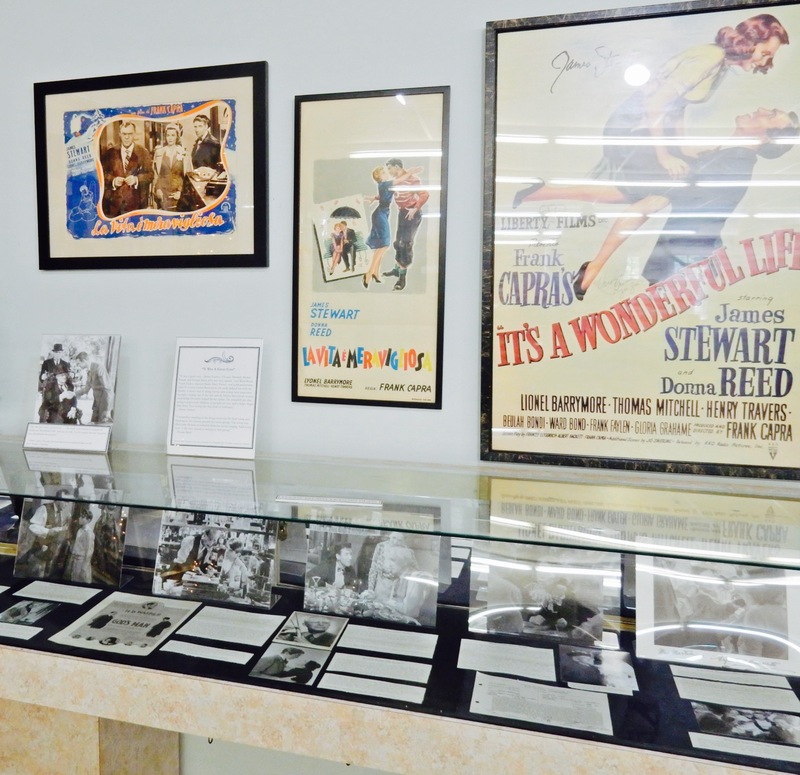 The museum is full of artifacts from the movie, and items representing Capra’s unifying values: among them, a ceramic bell inscribed with the famous quote, “Every time a bell rings, another angel gets his wings;” an exhibit about Donna Reed’s organization, “Another Mother For Peace” and its associate poster, “War is Not Healthy for Children and Other Living Things,” and the portfolio that 6 year old Karolyn Grimes showed Capra when auditioning for the movie. Come the 2nd weekend in December, and you can meet and greet Grimes, (along with other Bailey children actors), who played 6 year old Zuzu in It’s A Wonderful Life. Now, still beautiful at 74, Grimes had the kind of life ripe for a Capra film. She grew up in Hollywood, and worked with Buster Keeton, Bing Crosby, Jimmy Stewart, and Cary Grant (her favorite), before her mother died of cancer when she was 14 and her father was killed in a car accident the following year. Grimes was shipped off to her Uncle and “mean Aunt” in Missouri, where she was forbidden to act, and “learned about real people,” – merchants, teachers and others who “gave her the opportunity to see there are good people in the world.” Grimes became a Medical technician, married three times (her first husband was killed while deer hunting), had seven children, and in 1980, “a reporter asked if I played ZuZu in It’s A Wonderful Life.” This led to fan mail, interviews, and her very first viewing of the movie. Ever. At 40 years old. In 1993, Target used It’s A Wonderful Life in its ads, and, with the other Bailey-kid actors, she was hired to represent the film where it was supposedly set, in Seneca Falls NY. Fifteen years ago, the It’s A Wonderful Life Festival drew a few hundred people. Now, 10,000 to 20,000 people attend. The Museum, however, is open year round. Open Tues-Sat 11-4, free. 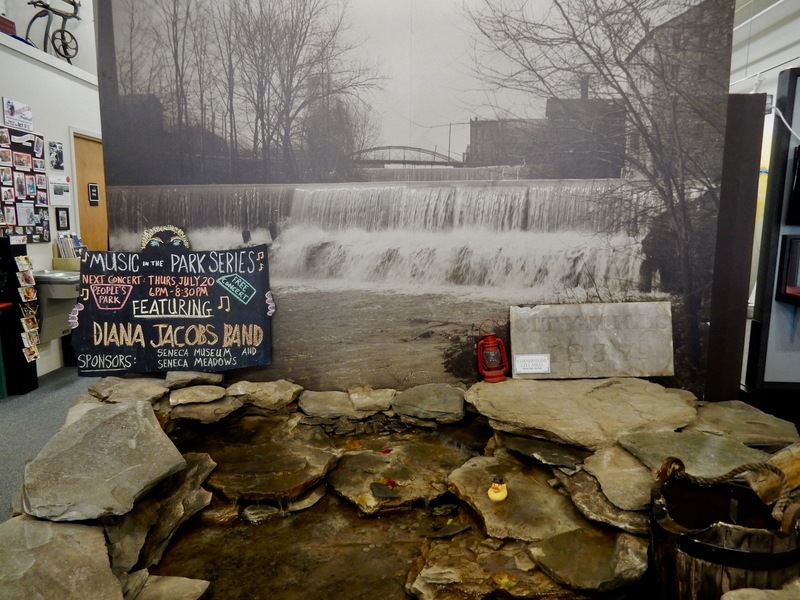 VISIT: Museum of Waterways and Industry, Seneca Falls. 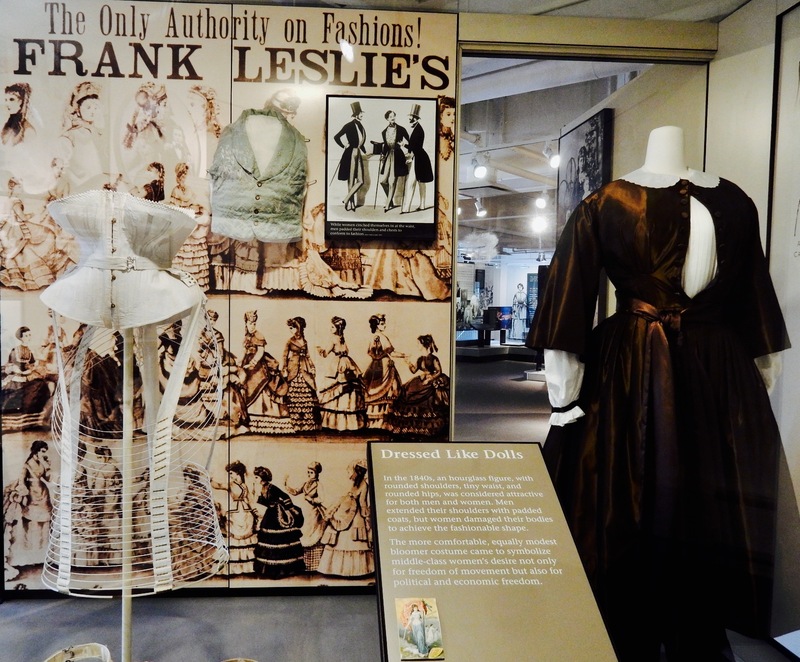 Three floors of exhibits, many hands on, tell the story of Seneca Falls industry. The town was considered “The Fire Engine Capital of the World” as base for Silsby Engines, and manufacturing center of Sylvania Color TV’s and Westcott Rulers. Best of all, the museum sits right on the Erie Canal overlooking the Bailey Bridge (and future mill home of the Center for Great Women). 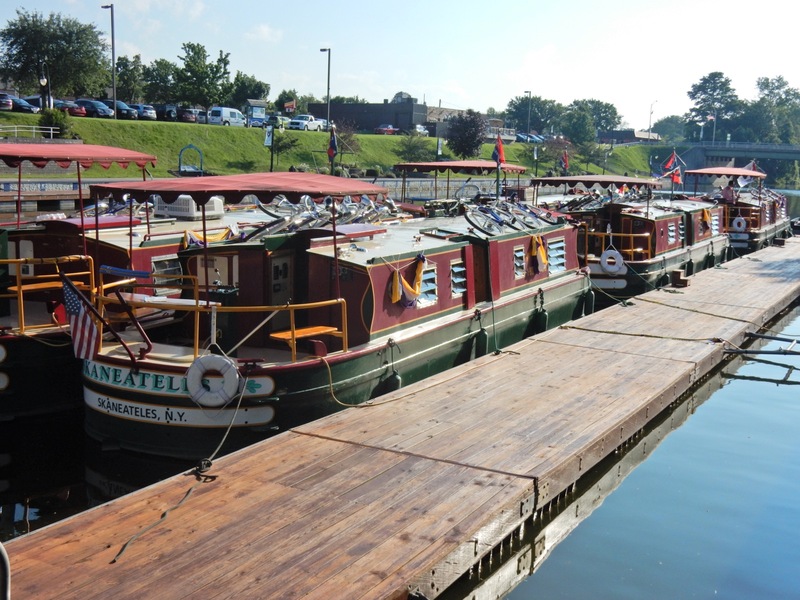 Seneca Falls has four canal locks (two double), so plenty of boats tie up right outside the museum, which, besides exhibits, offers toilets and other amenities for boaters on its ground floor. Open Mon-Sat 9-6, in summer, closes earlier other times of year, Sun. 12-4, free. TOUR: Seneca Falls Historical Society. 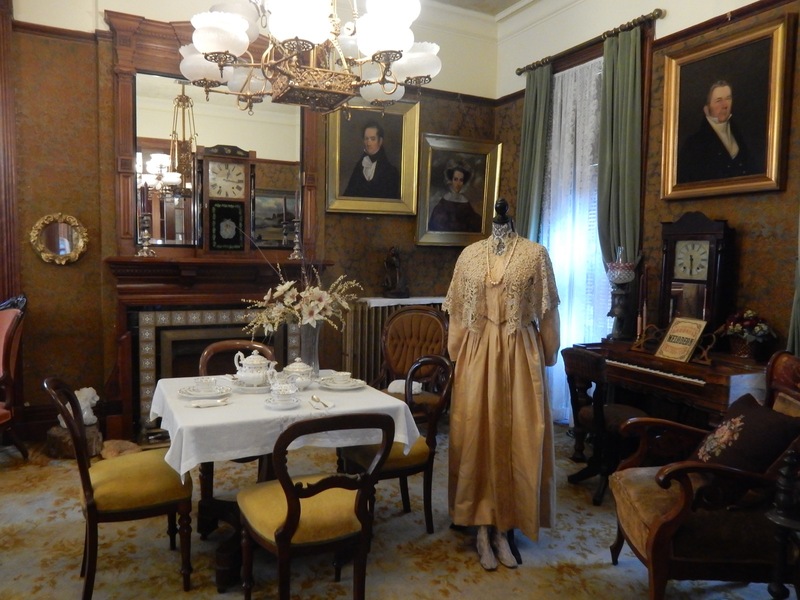 This stately 1855 Victorian home is loaded with Victoriana, of course, but also artifacts specific to the town. Check out the Drawing Room (where women would separate from the men and “withdraw” after dinner) to gaze on a tea set purchased by President James Monroe, used by Abraham Lincoln, and disposed of by Mary Todd Lincoln, who gave the complete set to her friend William Seward (of Seward’s Folly fame). The White House has since asked for the return of “Lincoln Tea Set,” but the Historical Society plans to keep it. 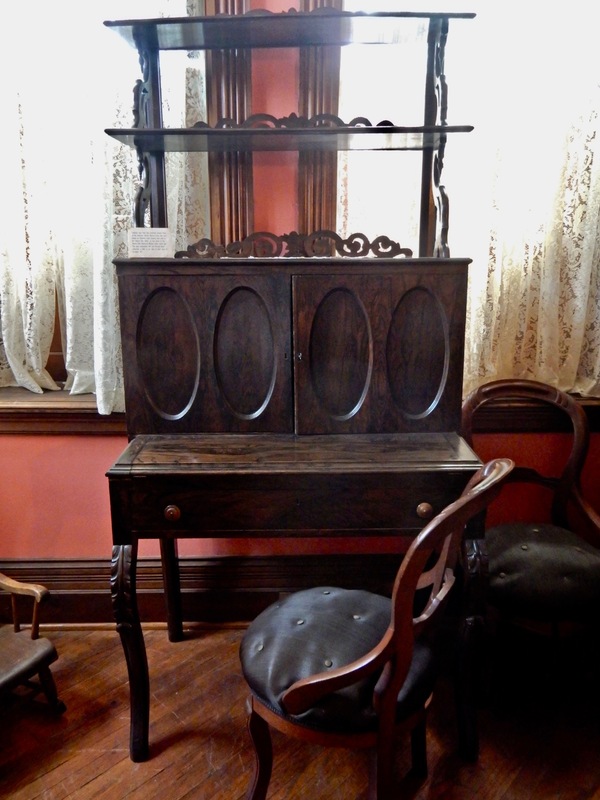 If you are into smart women of the 1800’s, you’ve hit paydirt here: the SFHS displays the writing desk that belonged to Elizabeth Cady Stanton (one she left here when she moved to Brooklyn), and the camera owned and used by Grace Woodworth, the photographer best known for her portraits of her friend, Susan B. Anthony. 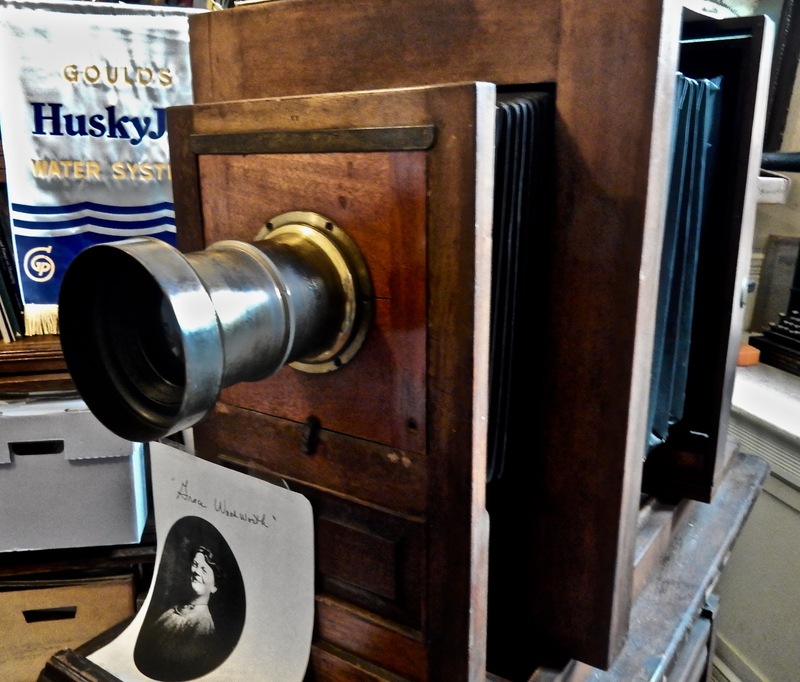 Quite possibly with this very camera. Open Mon-Fri 9-4, $15. 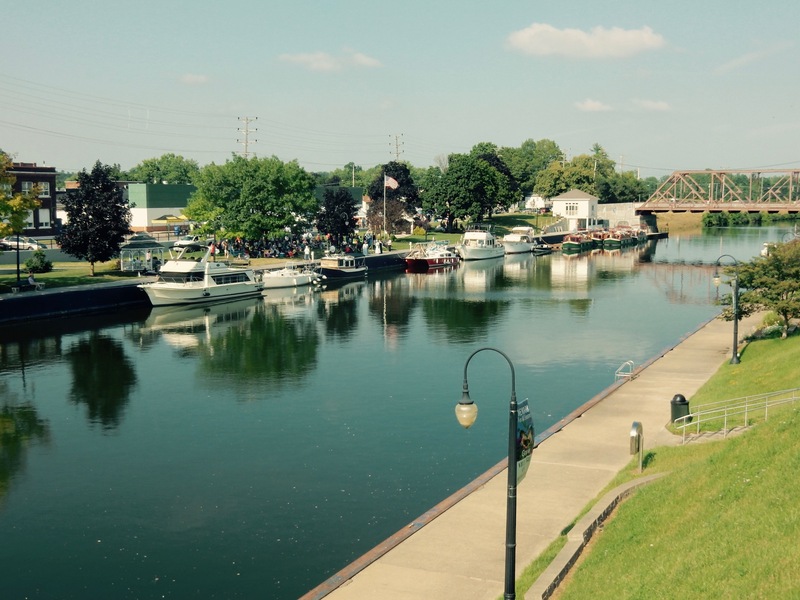 CYCLE/BOAT: Erie Canal – now the Erie Canalway National Heritage Corridor. It’s 365 Miles from Albany to Buffalo, and many people are now discovering the towns along the way. “End to Enders” as they’re called, are growing in numbers. EAT: Café XIX, Seneca Falls. 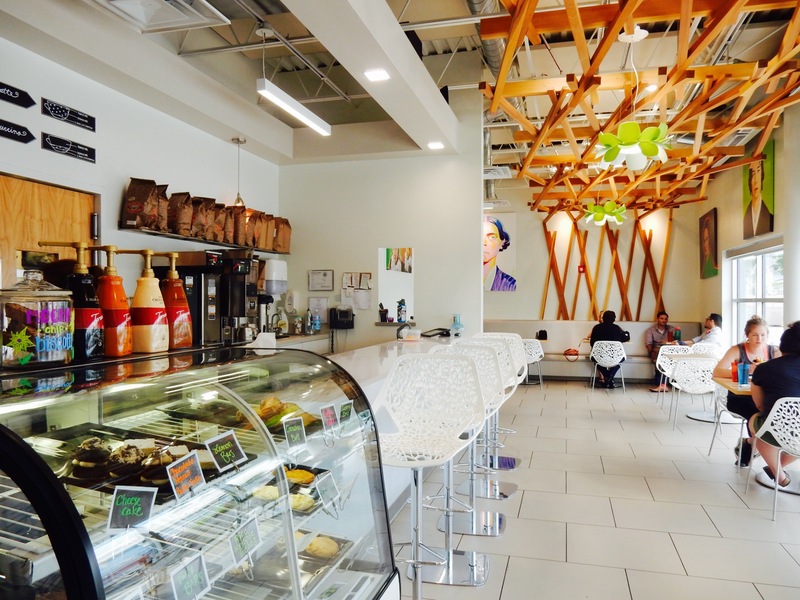 Referencing the 19th Amendment, this cool breakfast and lunch spot, offering fresh-fresh soups, salads and sandwiches, is funky and modern with lots of Suffragist Pop Art. Coffees and Lattes reflect its name: Underground (with chocolate and caramel), Lucretia “Malt,” Susie Bee (honey and almond milk), Raspberry Bloomer, and the like. Step outside and across the street to see the spot where Susan B. Anthony met Elizabeth Cady Stanton – marked by a statue of the scene – either before or after your meal. STAY: Vintage Garden B&B, Newark NY. 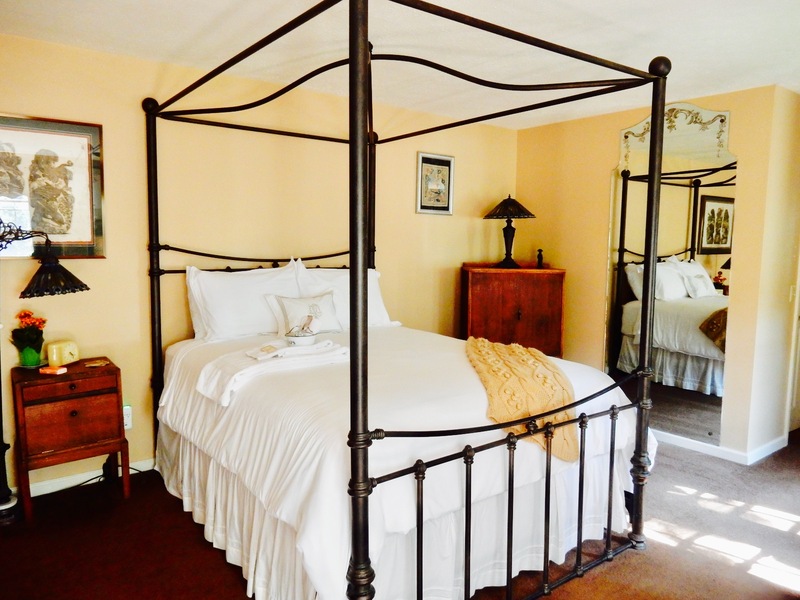 Just 30 minutes from Seneca Falls, (and 45 minutes from Rochester) in the small, walkable Erie Canal town of Newark, this exquisite 5-room B&B has a special pedigree. It was the home of Charles Perkins and headquarters of the Jackson Perkins Rose Co. – the floral brokers who brought roses to America. So you can just imagine how beautiful the grounds are. A Maven Favorite – this B&B warrants a complete write up HERE.